I am talking here about the car shows from last year until the warm months comeback for you all. I saw a crowd building around this white Mustang and that got my attention. 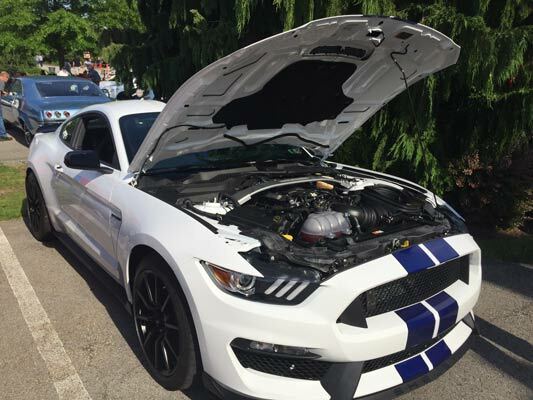 My friend Bob came over and told me that it was a brand new 2016 Mustang GT350. I made my bee line right over to this car and met the owner. Turns out this guy just got the car the day before from the dealer. Now, it was not a GT-R but who cares. That car had a big crowd around it and now I could see for myself why. He also brought his Boss 302 with that very cool Coyote engine. So, we began talking engines. Coyote, Trinity like I have in my Shelby, and his is a Voodoo. What an amazing car. I was up and down and inside and out of this car. Why? I wanted one very badly after reading great reviews from all sources. The experts who ever they claim to be all voted this car is better than the Hellcat Challenger and the Camaro Z28. Now, the other two hot rods are great cars but this Mustang shone way better. There was an aura around this car last night. The people that were there and knew cars all stopped all night long to look at this car. I bet that owner was tired from standing and answering the same questions over and over. He told me he paid just under 65k. I asked him why he bought it versus the others. Well, he was a Mustang guy but what made him pull the 65k trigger? Turns out he was watching a well known car show that test drives cars from all specters of the car industry. He said that when the test driver existed this car after putting it through its paces he had a big grin on his face. That was enough for that guy to order one that next day. And, it’s everything everyone says it is. Now, he gave me the ultimate compliment about my Shelby and for that I am grateful. As a matter of fact as I was leaving the show last night he was pulling out as well. He have me a thumbs up so I raced my engine a bit to thank him. I saw his smile get bigger and he waved as to say we are all right tonight.